Yes you read that right! The Italian site iDroid has managed to port the latest Android 2.2 OS (aka Froyo) to iPhone 3G. This port is based on the same iBoot method which was originally released for both iPhone 2G and 3G with Android 1.6. Apart from WiFi and sound, almost everything else is said to be working, including sending of calls and SMS text messages. If you are brave and want some adventure, follow the Italian-to-English translated instructions below to get Android 2.2 working on your iPhone 3G. We might have our own version of the guide up if we get this working. And hopefully, the developer behind iPhoDroid will bring support for Android 2.2 so that we can install it on our jailbroken iPhones within minutes. Openiboot installed on your iPhone. 2) Transfer the files on storage in this illustrated before. 4) compare three symbols on the iPod. Move to the second with the power button, and press the Home button on the top of the bottle. Done what the iPod will appear a series of writings. When display ‘Welcome to OpeniBoot’ the process is finished. Now displays that appear on the iPod also written on the terminal. Finished loading and joints on ‘Welcome to OpeniBoot’, type install from terminal and see other writing appear. After missing the written terminal we type in reboot and will always correctly completed the installation. Turn on your iPod go to the Android robot, press Home, and enjoy your Android device! and here is the video of it in action! Would this work on 2g as well? when these droid ports are OS4 compatible I'm there! i have an iPhone 2G.. 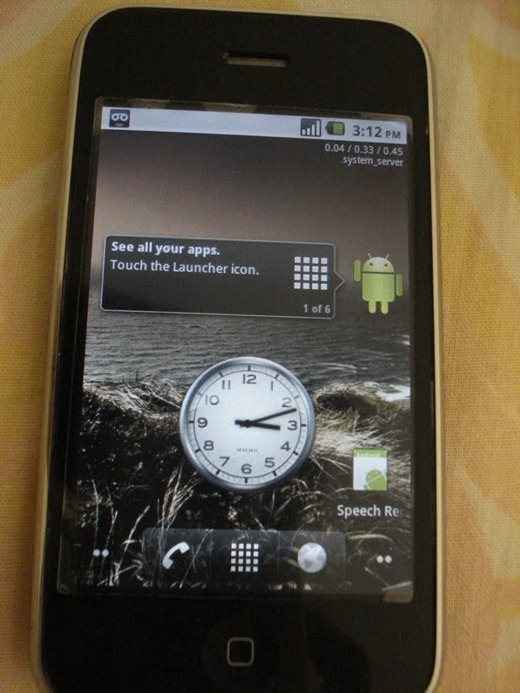 So, does this Android OS 2.2 works on my iPhone 2G? wich release of apple's firmware do you use? 3.1.2 or 3.1.3 ? I would really LOVE to try this out! If they can work out the Wifi and sound issues out I am definitely going to leave the old iPhone OS behind..
Great! i just tried and that simply works great! Works ok on my iphone 3G 8GB. How to reboot the phone ?? cuz i can't switch it off any more! My iphone don't change.. don't show anything when i execute the sudo command.. help me please..
are the power off's of android on iphone work?do they work now? if i install this on my iphone 3g and I dont find it nice, do they have uninstaller? Of course you ca do this…..my question is why…..hardware comonents of the iphone are not anything special…..frankly pple like thw device for the OS and user experience. ANDROID runs great on android phones…,and you will get more your money when it comes to hardware on a phone that was designed to run android. What u have is a novel and interesting device……but one that takes away the strength of the iphone and trades for it the lastest version of android woking ….sort of…..with a bunch of messy patches ….. why? Its cool but ultimatey its giving you something that offers less than android 2.2, and iphone OS as well.